The 2015 Trafalgar weekend (23 to 25 Oct 15) of the Royal Naval Guild of Bellringers was set to the east of Swindon. The weekend started off with some afternoon ringing at Chiesldon (6) and Wanborough (8), with many arriving late because of the traffic, it being the half term weekend. After some good ringing it was off to the hotel at South Marston to book in. Despite some confusion over the timing of dinner, 18 members sat down to an evening meal and seemed reluctant to leave the table until well after the plates had been cleared away. The meeting up of old friends is always a lively time and I hope that the other diners in the restaurant were not too put out with the noise level at our table. While some of the non-ringers sampled the delights of the hotel spa and swimming pool, the ringing fraternity had organised to share cars this year instead of a bus. This was an experiment after many years hiring a bus, but with rising costs and dwindling numbers it was decided to try car sharing and see how it went. So a fleet of cars left the hotel under darken clouds with a not very encouraging weather forecast. The first tower of Stratton St Margret, not far from the Swindon ring road, was a delightful set of 8 and there was an impressive church hall alongside for those who had travelled a long way and were in need of a comfort break. The weather by this time was very damp. The numbers swelled up as some members had come for the day due to commitments on the Friday and Sunday that restricted them to just attending Satruday. It was then off to Blunsden with its association with the Feke family. Another 8 but a light 5 ½ cwt this time. The final tower to complete the morning was out in the country side along a long drive at Hannington. Although a 6, it had the most amazing open spiral staircase to the ringing chamber, which reminded many of an Archimedes screw. The stairs also had the strange phenomena of being narrower at the top than the bottom, so despite climbing up one had the feeling of growing as you got higher as the space got tighter. We would have all liked to have lunched at the Hannington Jolly Tar but unfortunately they could not take the numbers. 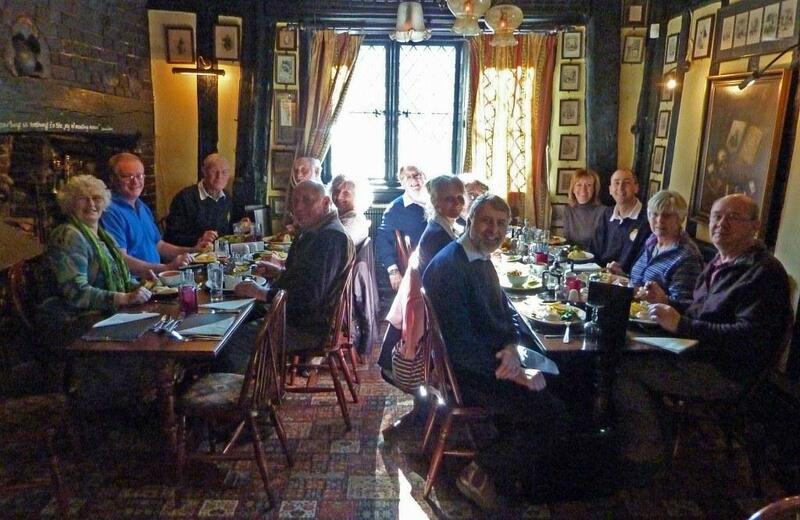 So it was off to lunch at the Saracen’s Head in Highworth where 32 sat down together. 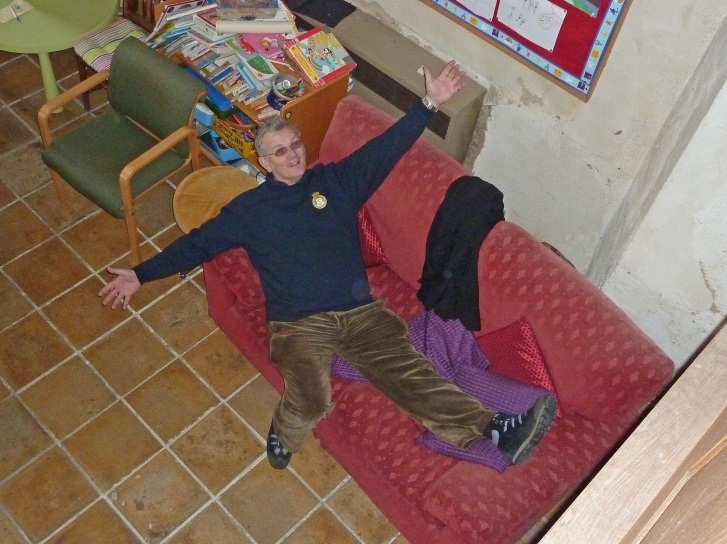 All just managed to eat before it was off to Highworth church for an 18 cwt eight. The ringing chamber included a fearsome set of horns and a peal board where the age of the treble ringer was included. A peal at fourteen and half is impressive. It was here that a picture was taken in the ringing chamber as the numbers had swelled to 25 ringers, something we have not achieved for some time on a weekend outing. From there we went to Longcot (8), which had evidence of a Royal Naval damage control party with an acrow prop supporting one of the wooden roof beams. It also had a memorial plaque to a couple who had lost their lives on the Titantic. There was also tea and coffee on offer, which was a very kind gesture of the locals and much needed by some. It was then onto the final tower at South Marston (6), where ringing went on beyond the allotted time as we were enjoying ourselves so much. Some it was homeward bound for some but for others it was back to hotel to use the spa facilities, before 16 sat down to dine. The noise level and the reluctance to leave the table were the same as the previous evening. It was a rolling breakfast next morning, after an extra hour in bed due to the clocks changing, with fare wells and members wending their way home, with thanks to the organisers. 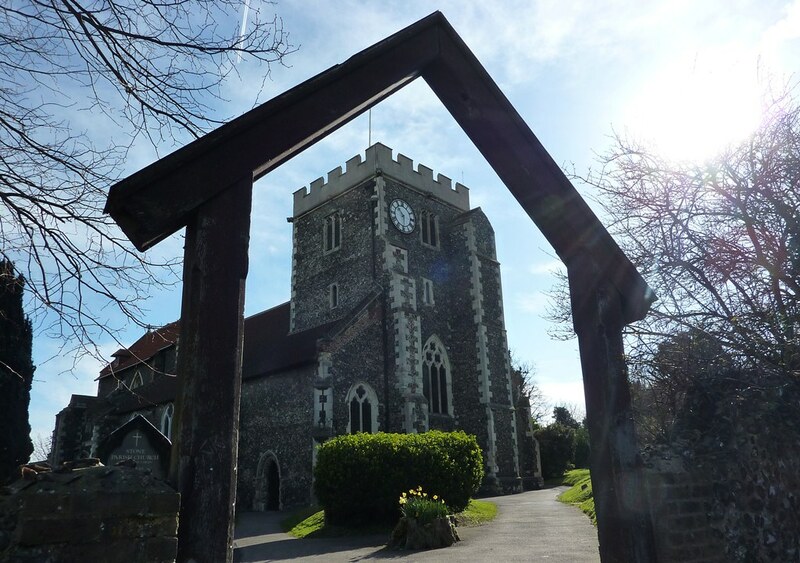 March 7th dawned bright and sunny for the Royal Naval Guild of Bellringers AGM in east Kent, arranged by Tim and Diana, with ringing at four churches during the day consisting of St Mary the Virgin in Stone next Dartford, St Botolph in Northfleet, St Mary Magdalene in Cobham and St John the Baptist in Meopham. St Mary the Virgin was a ring of six in a large ringing chamber, with the ropes in one corner on a sloping floor. Views over the Dartford crossing has been blocked with some very good sound proofing for the neighbours. They were lovely bells to ring. 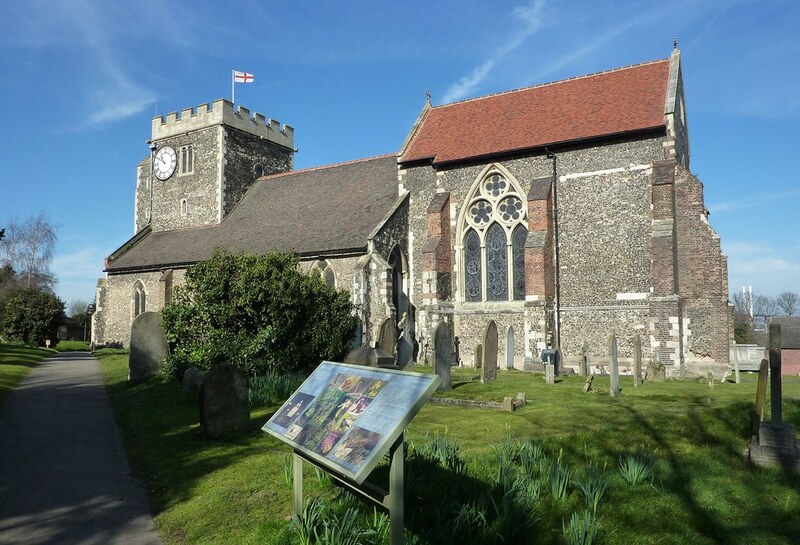 St Mary the Virgin, Stone next Dartford, known as ‘The Lantern of Kent’ due to its prominent position over the River Thames and ‘Little Westminster’ with its similarity to parts of Westminster Abbey. St Botolphs was a very interesting anti-clockwise ring of eight, very lightly set, some oddly struck and although light, felt heavy to ring. The boiler for the church went through the ringing chamber and the key holder told us that in 2012, on Remembrance Sunday, two of the Bellringers were taken to hospital with Carbon Monoxide poisoning, due to a flue being blocked!!! A very pleasing lunch was taken at The Leather Bottle, a 17th century pub in Cobham, which is mentioned in Dickens Pickwick Papers. Over the road from the pub St Mary Magdalene had a very nice ring of six, with 36 steps to climb, which helped to settle our lunch! Lunch in the Leather Bottle, regularly frequented by Charles Dickens and is full of illustrations from his novels along with his travelling bag on display and St Mary Magdalene, Cobham, where The Hon. Ivo Bligh, Lord Darnley, who was presented with the famous cricket Ashes urn, is buried. St John the Baptist was our last ring of the day with an interesting ring of eight, with the clock workings running through the ringing chamber. The Church service was held here at the end of our ring and although it looked like an old church the interior had been modernised, with modern chairs instead of pews, tiled floor, a beautiful altar and bright lighting. The service was led by Tony, the 94 year father of John, who gave the reading. With no organist we didn't quite raise the roof, but we did make a noise!! The AGM took place in the light and airy church hall where we had a good tea, with a varied tasty selection of sweet and savoury. Although the numbers attending this year was disappointing, those who did attend had a really memorable day and thanks were extended to Tim and Diana for their hard work in organising the towers and the church hall. The obligatory photo was taken before we left with Chris and Hazel's black Lab at the forefront. Throughout the day a good selection of methods were rung including St Simons, St Martins, Deadman, April Day, Steadman, Grandsire, Plain Bob and Cambridge. 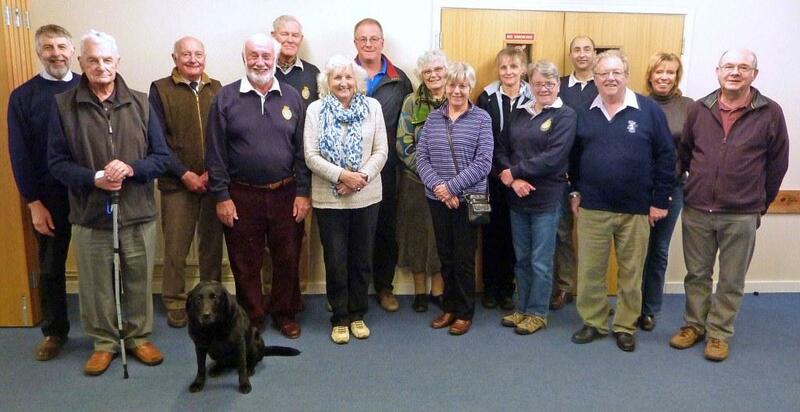 The 2014 Royal Naval Guild of Bellringers Trafalgar weekend (17th to 19th Oct 14) outing took place in William’s ancient royal hunting reserve of the New Forest. It started with the 6 at Minstead where Coonan Doyle is buried and has a Sherlock Holmes pipe on his grave. This was followed by Lyndhurst where the original Alice Hargreaves (nee Liddell) of Alice in Wonderland fame was buried. Was it going to be a literary weekend? Unfortunately not but as one member remarked the bells had been surreptitiously challenging: what a delightful expression, so had all the exposure to literary figures rubbed off?. Back at the hotel a good number sat down to diner but there was much confusion over the orders and a number of people got the wrong fayre or had to wait a long time for theirs. One member was upset by a lack of anchovies in his Caesar Salad and quaintly the fruit salad was obviously a Lyndhurst variation with slices of fruit simply laid out on a plate, lots of fruit but not much salad! Saturday started off overcast as we set off in the bus to Britford. Here the ground floor long draught in the centre of the church was found by some to be a struggle but this was capped by the locals walking through the ringing circle then putting the lights on and off as they prepared for a Christening. Ringing and trying to read Morse Code by light simultaneously is not to be recommended. Bring back semaphore I say. It was then off to Downton, rather heavier that Britford which led to one member introducing the Downton pull-off of “Treble’s going, urghhhh, it’s gone”. I am glad to report the bells went well and we had some good ringing. It was a short journey to Fordingbridge where the bus had to be moved to allow delivery of an organ from the back of van. This was made up for by some good ringing on a nice set of bells. After a rather long lunch at the George, they insisted on serving each course in turn around the main course and as usual some had starters and other desserts, we wended our way to Damerham, an interesting Saxon church set in the country side. It was soon off to the last tower at Cranborne where a number of members had difficulty with the seventh’s rope that jumped off the wheel, much to the shame of the ringing master who was the first to experience this delight. It was back to the hotel where a few stalwarts stayed a second night but some opted for a local restaurant rather than the novel hotel experience of hotel victuals for a second time. After breakfast we all departed with some ringing in local churches on the way. It was the end of a delightful weekend in a pretty part of the country, with great thanks to the organisers. After being promised a sunny weekend by the Weather Lady, it was a dry start to the day and looked as if the sun was there somewhere trying to impress us with its presence. 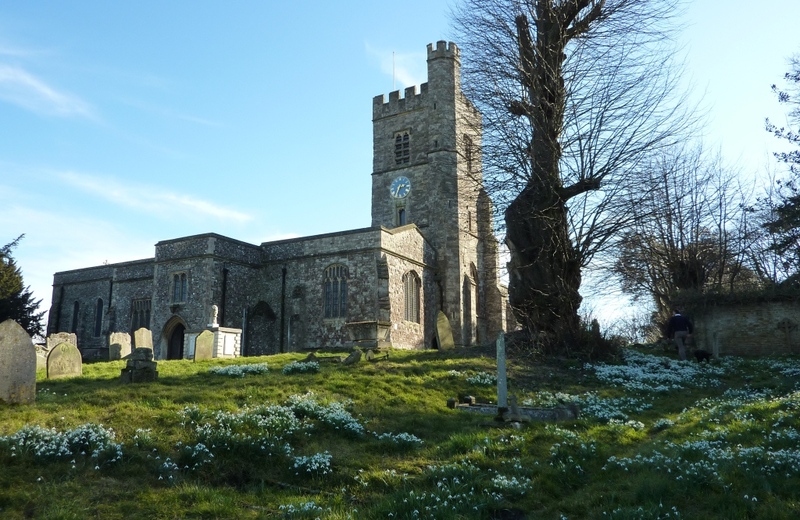 Many of us arrived early at Buckden in Cambridgeshire keen to get on with some ringing, or was it the promise of home-made tea and cake that was the lure? Anyway, we got going early and enjoyed some pretty decent ringing on this 13 cwt 6. From there, on to Godmanchester and the 19 cwt 8 which we were told were a bit loud with long draughts, but we had some respectable rounds and call changes and a couple of courses of Stedman. Single Oxford was also attempted successfully, so not a bad effort all round. On emerging from the church, we were met by “Mr Angry” who thought we were all very selfish for spoiling his Saturday by ringing these horrid bells. It seemed he had not lived there for long and hadn’t noticed the big building with the tall tower thing attached next door when he had bought his nice house in this nice little village. Anyway, he got loads of sympathy as we all left him to enjoy the rest of his nice weekend. So, then to lunch at The George Hotel in Huntingdon where we enjoyed a very nice meal in pleasant surroundings, before moving on to the light 6 at All Saints. By now the yellow thing in the sky had indeed, put in a welcome appearance and the centre of Huntingdon was bustling with the market in full swing right next to the church. The light but quite odd-struck 6 with a particularly low ceiling made for a challenging ring for some. Once again though, with perseverance, we managed rounds and call changes, Plain Bob Minor and a bit of Grandsire and not a bad effort all in all. Health and Safety was covered by the RNGB President for those who may have fallen from the balcony in All Saints Huntingdon! Then on to the last tower of the day, the 16 cwt 8 at St Mary’s. We were warned that they were “a bit loud”, which was not an exaggeration and we also found them quite odd struck. Hung in the 1880’s and largely in original condition, most found these bells very challenging to ring and we struggled to manage any method ringing. Finally, with a strong band, we rang a reasonable course of Plain Bob Triples and some rounds and call changes. Some of us quietly admired the band who rang a peal of Superlative in 1913, marked by the solitary peal board on display. 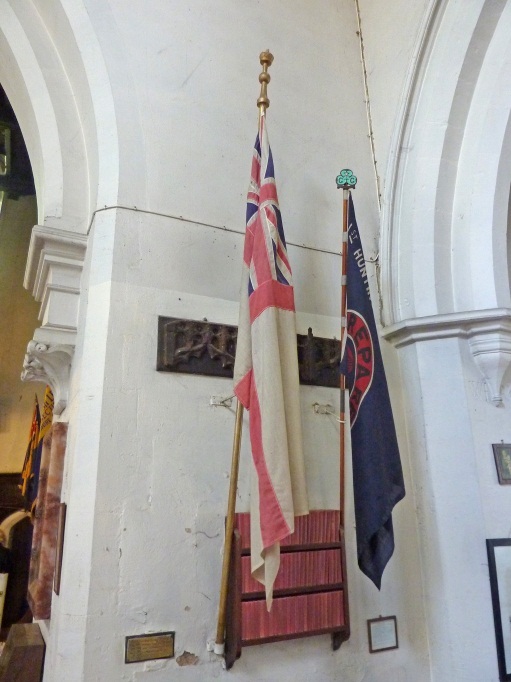 The White Ensign flown by HMS Walpole during the Great War 1914-18 and presented to St Mary’s, Huntingdon by the Lords Commissioners of the Admiralty. Our ringing complete, we then returned to All Saints for the Service which included some impressively sung hymns, delivered with no accompaniment. The vicar included a short address with an interesting tale of his family’s seafaring history and an anecdote about respecting ones senior officers and not suffering fools, but warned of getting the two principles mixed up! Following the service, we hot-footed it back to the Church Hall at St Mary’s and a very welcome cup of tea and sandwich. The meeting followed the normal course and many volunteers were volunteered for future events and huge thanks were given to Elsepeth and Doug for laying on a fine outing.